On a cold and rainy night in Hanover, senior Justin Donawa scored the game-winning goal just 38 seconds into overtime to lift Dartmouth over Albany, 1-0. Sophomore Dawson McCartney had the assist on the game-winner. 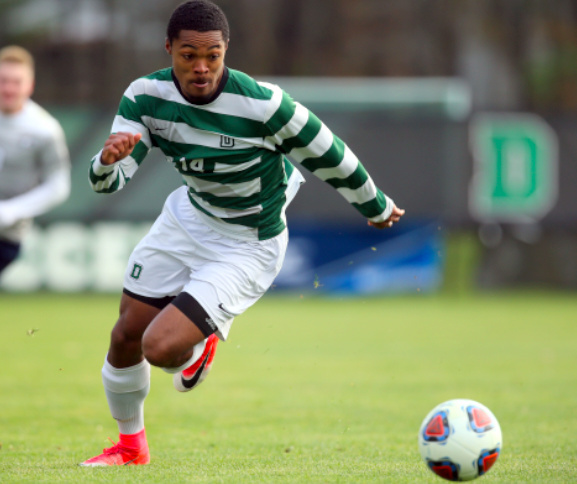 It was the second straight game that Donawa propelled Dartmouth to a victory in overtime. Dartmouth were outshot 11-9 by Albany but each team was even with two shots on goal. Albany finished the night with a 6-3 advantage in corner kicks. The match started off with a slow pace as both sides traded a shot in the early going. Albany then took control racking off five straight shots to finish the first half. Each team only had one shot on goal and went into the break scoreless. Offense was more evident in the second half of play. Although Dartmouth did not have a shot on goal, Dartmouth outshot Albany 6-5 in the half. Junior goalkeeper Henry Stusnick saved the game in the 88th minute with a huge stop to send it to overtime. Dartmouth was on the attack early in overtime and it paid off. After Dartmouth tried to get the ball inside, it was deflected out to McCartney who sent a perfect cross for Donawa who headed it home to give Dartmouth the 1-0 win.